In 1989 I lived in Paris while teaching at the University of Paris VII. I had to arrange my own housing and at first lived with an elderly Englishwoman in the 15th arrondisement who only boarded academics. Later, I moved out and found a small studio in the 13th. In Paris having une bonne adresse is part of one’s social profile. But for me a good address requires a neighborhood that provides in its orbit of proximity all or most of the features I regard as essential to an urban neighborhood. It’s a nice bonus if it has an interesting history as well. I had rented the tiny studio from a school that taught fashion design and apparently figured they could squeeze a few more fancs out of a professor than its students. It was so small I could take the coffee from the hot plate without getting out of bed. To sit on the toilet required sliding one of my legs under the sink. The flat has a “balcony” accessed from floor to ceiling French doors, but it was only about eighteen inches deep, more for appearance than functionality (although adequate for drying underwear). My desk and dinner table were the same small piece of furniture, so I had to move everything when I ate. It should also be added at this time, and anachronistic as it may now seem, that at that time, 1989, I had no computer (only a small “electronic” Casio typewriter), no cell phone, no television, no Wi-Fi, no GPS, none of the aides to information and its processing that we take for granted today. I communicated with family and friends mainly through air letters written, of course, and longhand, international phone calls were rare and are usually made them from a phone cabinet at the local bureau de poste. I had a small transistor radio and listened to some tapes on my Walkman. Mostly I read books, went out to see movies, walked the city, and kept my journal. It was a solitary, sometimes lonely, low-tech urban experience. But this cramped existence, commonplace in older cities, has its compensating features. The immediate neighborhood becomes of great importance. Sidewalks, piazzas, cafés and markets come to serve as public spaces of convivial encounter, substituting as parlors and living rooms,voisinage becomes an extension of maison. 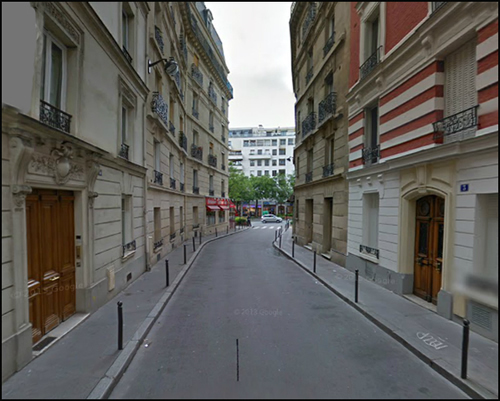 At the bottom of my building in Villa de Gobelins, at its corner with the Avenue des Gobelins was a café-tabac where I could grab a quick café espress at the comptoir. A few feet away was a journeaux stand that sold my International Herald Tribune and the thick PariScope that lists all the films playing in Paris for the month. A dash across the street to the patisserie-boulangerie and I could obtain a fresh baguette and acroissant d’almond. The market is less than a hundred meters in one direction, with a laverienext door, and the bureau de poste is the same distance in the other. There are movie theaters, stationary stores and libraries (book shops) and a couple of banks all along the street that are interspersed with brasseries and various other cafés and restaurants. A taxi rank is right at the corner, as is a bus stop, and the Gobelin Metro station is two blocks north, making all Paris accessible with my Carte Orange, a monthly pass to the Metro and buses. This might not be everyone’s idea of ideal urban living, but the un-commodious space of a studio flat excepted, it was mine—a local neighborhood of many indigenous land uses at neighborhood, not Wal Mart and Costco, scale, with variety and the possibility of familiarity. Every shopkeeper might not be smiling and solicitous, but even in a place that can be as fussy and aloof as Paris, there comes, after some time and repetition, some reserved recognition that you are “of the neighborhood.” You are still the etranger, but this urban context is as close as one gets to being not a traveler, but a guest. Then comes one day when some other “stranger,” perhsps from Lyons, or Brussels or Bordeaux, asks you as you are abroad in the “hood”: “Excusez moi, monsieur, ou est la Mairie de la Treizième,?” And you reply in French that makes them wonder where the hell you are from; but with confidence and sufficient accuracy, you manage to direct them to the local town hall like somebody who knows the neighborhood. *Duiker, William J., Ho Chi Min, A Life, (NY; Theia Books, 2000), following P. 330. Ho was evicted from Villa des Gobelins later that year for his radical politics and moved to an apartment in the north of the city.